Sesame oil derived from sesame seed, is also known as gingelly oil. It is commonly used in Chinese, Indian and Japanese dishes widely. 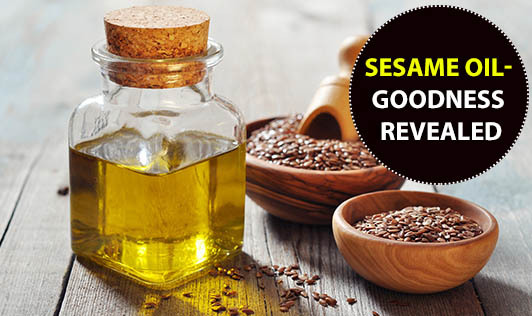 Sesame oil is a great source of healthy fats, as well as essential nutrients and minerals. Sesame oil has also been used as a component of Ayurvedic medicines since several years. • It is widely used as carrier oil in Ayurvedic massages, due to its high absorption properties and high content of vitamin E.
• Sesame seed oil might help keep the joints flexible. • Researchers have found that the sesame seed oil significantly reduced blood pressure. • Vitamin E content in sesame oil and the capacity to hold moisture helps in keeping the skin and hair nourished. • Phytosterols in sesame oil might help in reducing cholesterol and reducing the risk of certain types of cancer. • Antioxidant properties of sesame oil not only offer numerous health benefits, but also helps to extend its shelf life and preserve the flavor over a longer period of time. Multiple Clinical studies are still going on about the benefits of the oil on human health. Make sure you use the right amount of the oil and use it the right way. Use sesame oil in your salads, marinades and stir fry vegetables for nutty flavor in your diet.